This Transmitter “Turns On” or “Turns Off” a Lightning Receiver ... or 2+ Receivers as a group... or one or more Receivers that you can’t see. It is slightly harder to push but sends a stronger signal (therefore increasing the range) compared to the standard-range transmitter. Typical range is 60-75 feet. Pushing the right button will send an "Off" code. 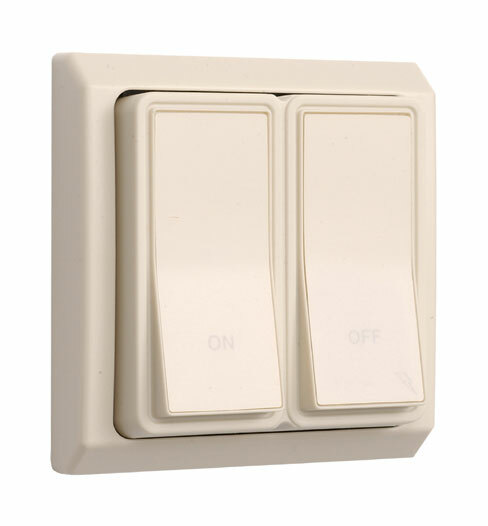 (approximately the same width as a standard North American light switch plate). This Master Transmitter turns "On" or "Off" one or more Lightning receivers as a group. 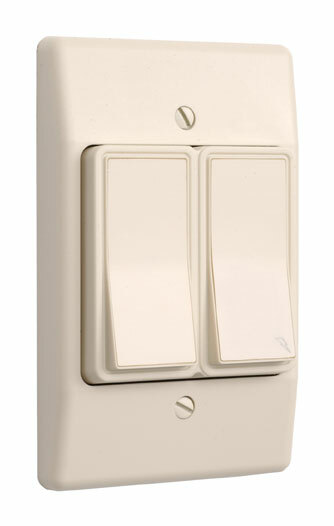 This transmitter is approximately the size of a typical North-American switch plate and comes with colour-matching mount screws for mounting to an existing switchbox or directly into drywall. The buttons have the words "On" and "Off" in light print.